When Fed Ex delivered a Mavic Air to my house last week I opened the front door before the driver even had a chance to ring the doorbell. I realize I'm a little boy trapped in a man's body, but I'm guessing Im not the only one. If you are getting a new Mavic Air I bet you're just as excited as I was. But before you take it out to fly there are a few things you need to do to get it set up. This article will give you a heads up and hopefully speed up the process a bit so you won't have to delay your gratification any longer than necessary. When you get your drone, the batteries and controller will have some charge in them, but not enough to fly. If you do this step first, they can be charging while you take care of other items on the list. You'll still finish everything else before they are fully charged, but at least they'll have a head start. If you got the Fly More Combo, connect the cord from the AC adaptor to the bottom of the battery hub. Now you can open up the sides of the hub and connect all three batteries. 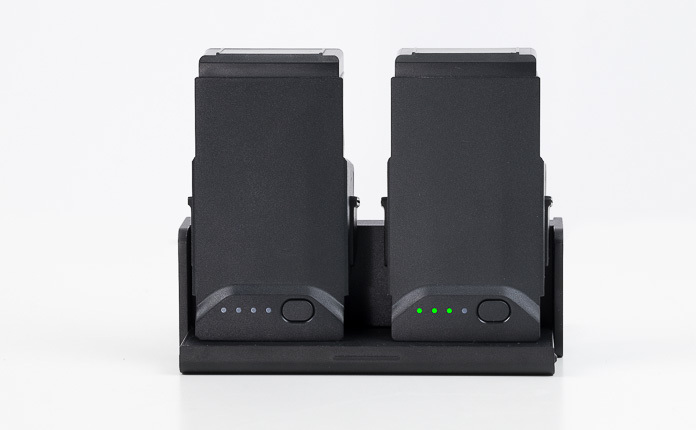 Unfortunately, they don't all charge at once, The one that has the most power charges first, then then the next and finally the one with the least charge to begin with. When a battery is being charged, it's status lights will blink. 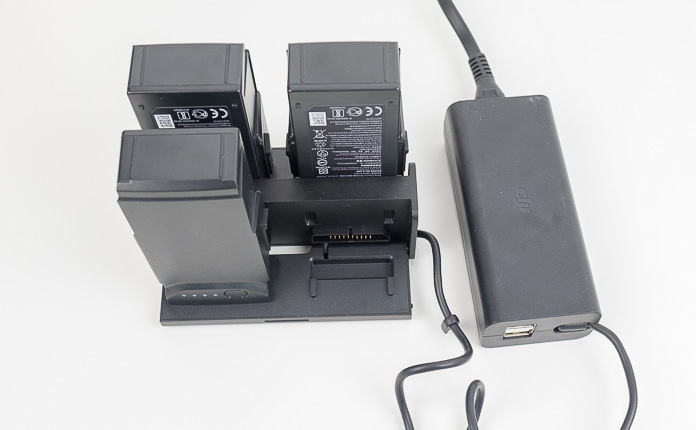 To charge the controller, connect the little USB-C to Micro USB adapter to the end of the USB-C Cable that was included in your package. Then plug the USB end of the cable into one of the two USB ports on the end of the AC adaptor. Connect the other end of the cable into the Micro USB port on the top left corner of the Controller. The status lights will start flashing to let you know it's charging. So your charging station will look like this when everything is plugged in. It's probably going to take at least an hour to get everything up to 100%. That's OK though, you can go ahead to the next step in the setup process. DJI is very generous with stickers on the Mavic Air. There are stickers on the arms, the battery, the top, the gimbal cover, and the the controller. They are everywhere. They all need to come off. If you live in the United States, as of December 2017 you are required to register your new Mavic Air with the FAA (Federal Aviation Administration). Despite the fact that you are dealing with a government agency, it is a remarkably easy process and is very inexpensive. Just go to www.faadronezone.faa.gov to complete your registration. If you have registered drones before and already have an account, go ahead and login. If this is your first drone you need to pick one of the two options available. The language here is a little confusing (it is the government after all) but it's important to pick the correct one. 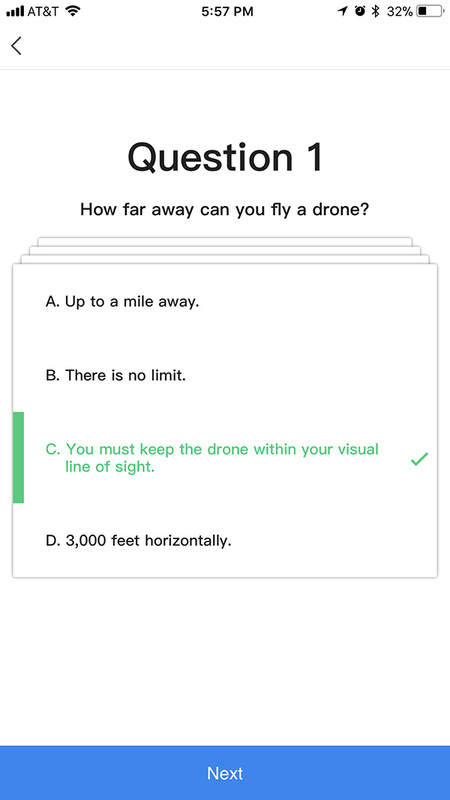 If you have taken the FAA exam to get your commercial drone license so you can earn money with your drone (also known as a Part 107 certificate), select the "Fly sUAS under Part 107" option. Just in case you're wondering, sUAS stands for Small Unmanned Aircraft System. The registration cost is $5.00 per drone registered. If you do not have a commercial drone license and plan to fly recreationally, select the "Fly Model Aircraft under Section 336" option. With this option you only need to pay the $5.00 fee one time no matter how many drones you register. Once you complete the registration process you will get a registration number which you will need to put on your drone in a place where it is clearly visible. You can write it on with a Sharpie. If that seems like you are defacing your beautiful new drone, you can use a label of some sort. Just stick it on one of the folding legs and you'll be all set. Just be sure you are at the official FAA site (it will have a .gov address). If you do a Google search for "drone registration" the top hits are for sites that do a very good job of making themselves look like the official site, but will charge you a lot more than the FAA. They are basically scams. If you want more details about how to register your drone, you can check out a tutorial I have done that will walk you through the process step-by-step. Technically, only the first one is absolutely essential. 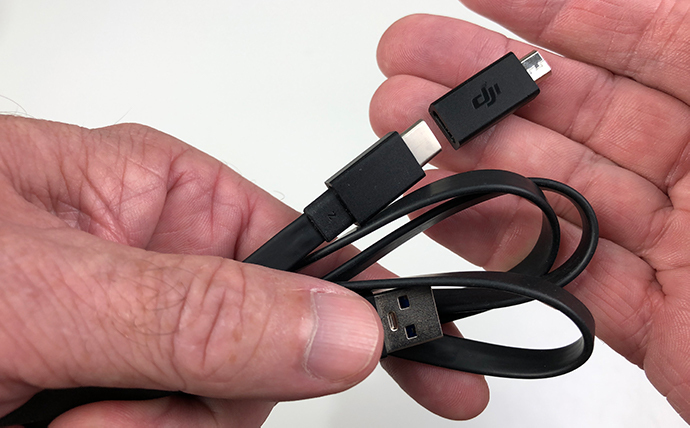 You won't be able to fly your Mavic Air without it. But I consider the other two to be essential as well since I use them every time I fly. The good news is they're all free! This is the app you will use on your phone or tablet to fly your Mavic Air. You can download it for free a the App Store for iOS devices or the Google Play Store for Android devices. Just make sure you download the DJI GO 4 App, not the DJI GO App. 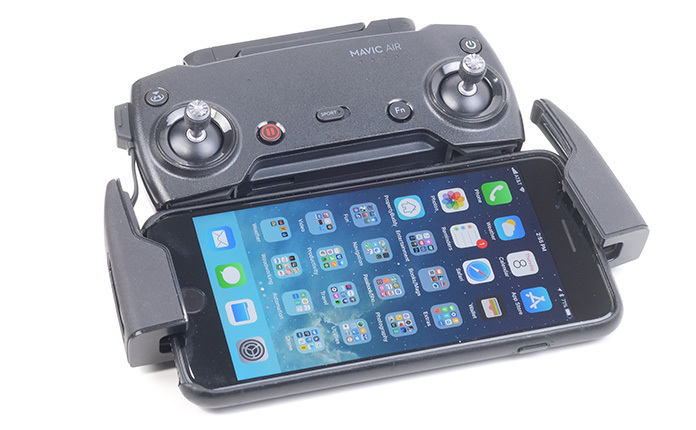 That is an older version, though it is still used for the DJI Osmo Mobile gimbal for smartphones. Obviously, you can stick your head outside and get a pretty good idea if it's OK to fly. But this app will give you information about wind speeds at various altitudes, potential magnetic interference, visibility and more. And it does in a very clear interface. You can get it at the App Store for your iOS devices or the Google Play Store for Android. I have done a tutorial on this app you can take a look at. It is really important that you only fly in locations where it is legal. It is absolutely impossible to know if you are in a restricted area without a map showing the boundaries of restricted airspace. There is some geofencing built into the DJI GO 4 app, but it will still let you fly in a lot of places you shouldn't. As soon as you launch Airmap, it will show your location along with any flight restrictions. In some areas of the United States, you can even use Airmap to get instant approval to fly within some restricted areas. You can get it at the App Store for your iOS devices or the Google Play Store for Android. I have done a tutorial on this app that shows you all the features. This is where the fun stuff starts. It's time to power up your new baby watch it take its first breath. Well, kind of. It will beep and make some other noises and lights will blink. Pretty exciting stuff in a nerdy kind of way. First, grab a battery from your charger that has at least a 50% charge. If you press the button on the battery, the status lights will show you how much charge it has. You are looking for at least two lights. 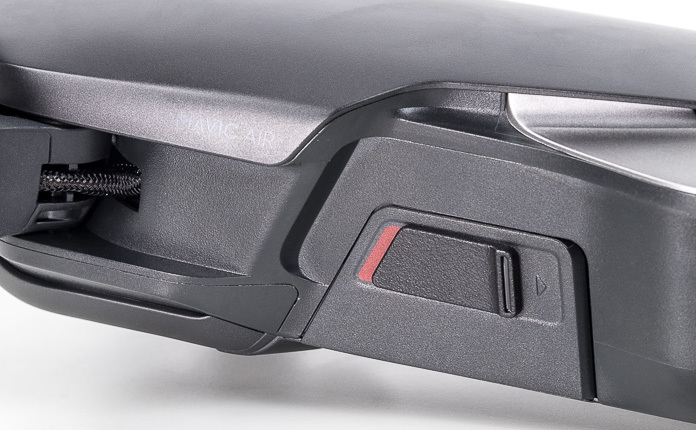 Slip the battery into the battery compartment on the bottom of the Mavic air and press down until you hear it click. You shouldn't see any red on the sides by the battery release slides. If you do, press on the battery again until it is firmly seated in place. The controller ships from the factory with the cable to connect an iPhone installed. If you have a different phone, you will need to swap out the cable with one of the others that was included in the box. 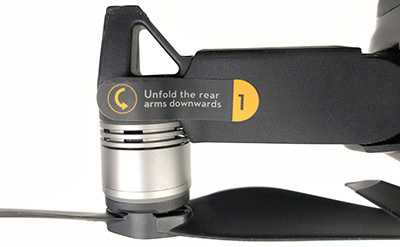 Unfold the controller's arms and slip your phone into the slots. You can take the control knobs out of their slots under the arms and screw them in if you want, but you don't need them in order to do the activation. You might find it easier to connect the free end of the cable to your phone before you slip it into the controller. Now press and release then press and hold the power button on the controller for about a second to power it up. It's a bit like a double click on a mouse, except you hold the second click down for a second or two. There's a certain knack to the timing that you will get eventually. 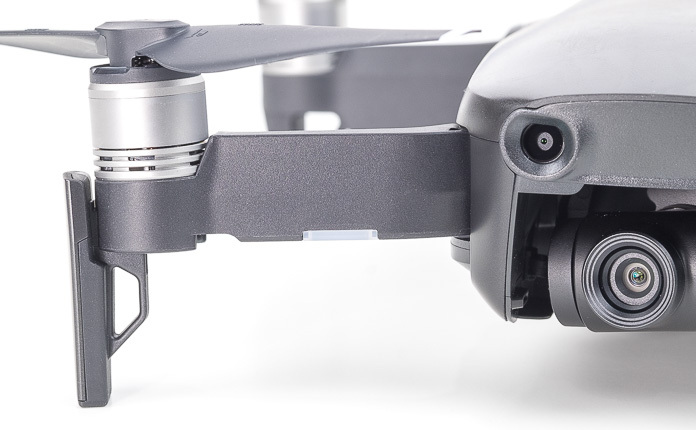 Now take the gimbal cover off of the camera on the Mavic Air by pinching the release tabs and sliding the cover toward the front of the aircraft. You're not going to be using the camera just yet, but when the drone powers up the gimbal goes through a series of moves, so the cover needs to be off. Now unfold the arms, starting with the rear ones, and fold down the landing gear legs located on the front legs. 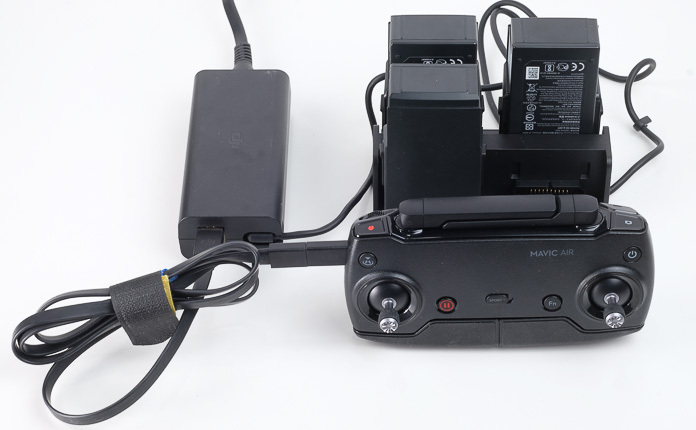 To power up the Mavic Air, do the same double press technique as you did on the controller on the button located on the battery. Don't worry, the props are not going to start spinning. There is an internal fan that will kick in a couple on minutes after you power up the aircraft. That's normal. It is designed to create some airflow to keep the electronics cool. 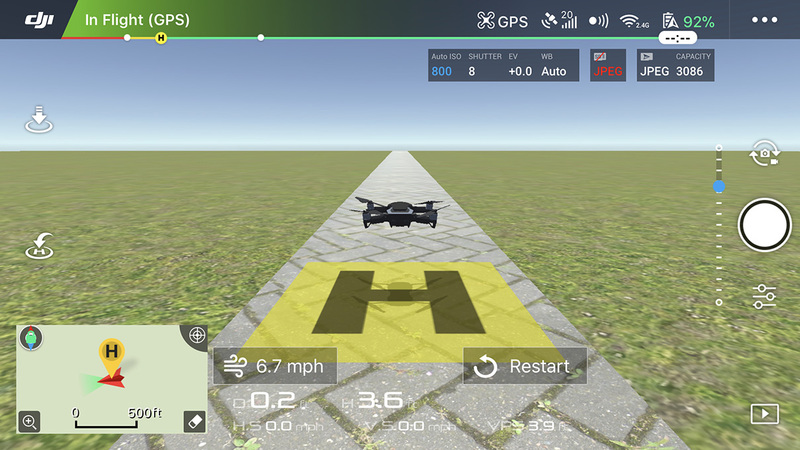 When you launch the GO 4 app, a screen will open telling you you need to activate your Mavic Air. Tap on "Next" and work your way through the next few screens where you will agree to the terms of service, give your aircraft a name, select a Control Mode (stick with Mode 2), and set your measurement system. You will then be given the option to put your Mavic Air into Beginner Mode. If you are new to flying drones I highly recommend doing this. It limits the speed, altitude, and distance as well as makes the controls a little more forgiving if you push them the wrong way. 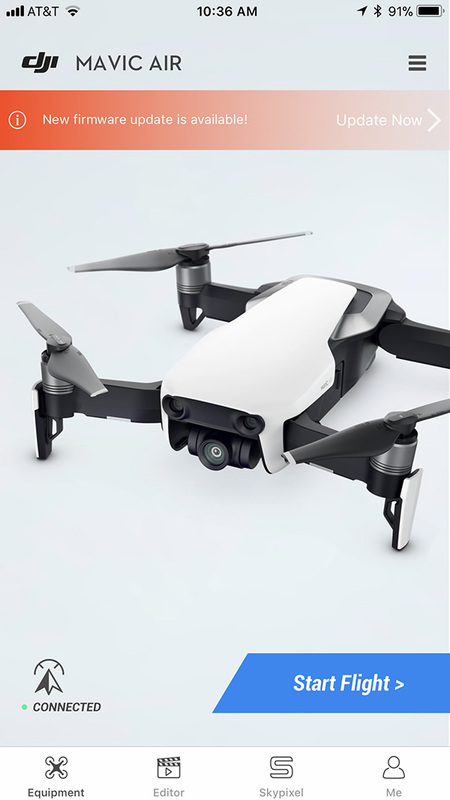 If you already have a DJI account, it will simply add this new drone to it. If you don't have an account, you will set one up. Eventually, you will see a screen with a big Activate button at the bottom. 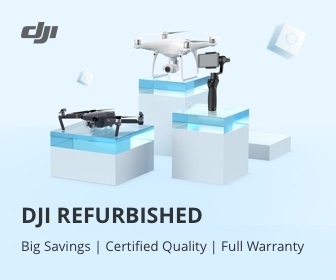 Tap the button and you will be given a chance to purchase DJI Care Refresh. You can learn more about this program on the DJI site. If you are new to drones I would consider getting it. It will provide up to two replacement drones for a nominal price within one year. I find the peace of mind that comes from knowing I won't be out $799 if I have a crash to be worth it. 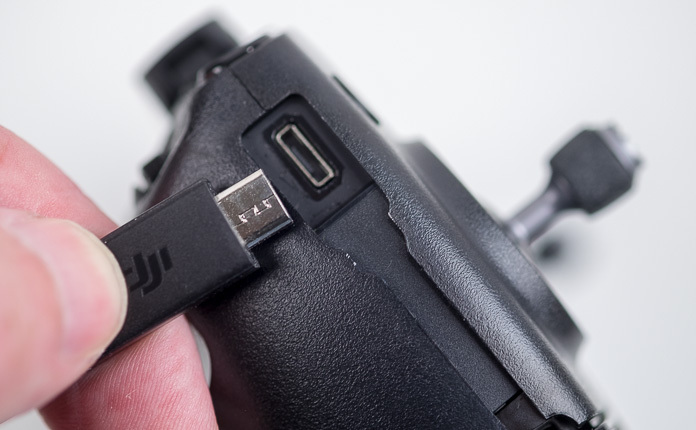 This is something DJI developed in order to promote flight safety. You can skip it for now if you like, but you'll have to take it eventually. There are nine questions and they're all pretty basic. Here's the first one along with the answer. But that's all you get. Any more and it would be cheating. 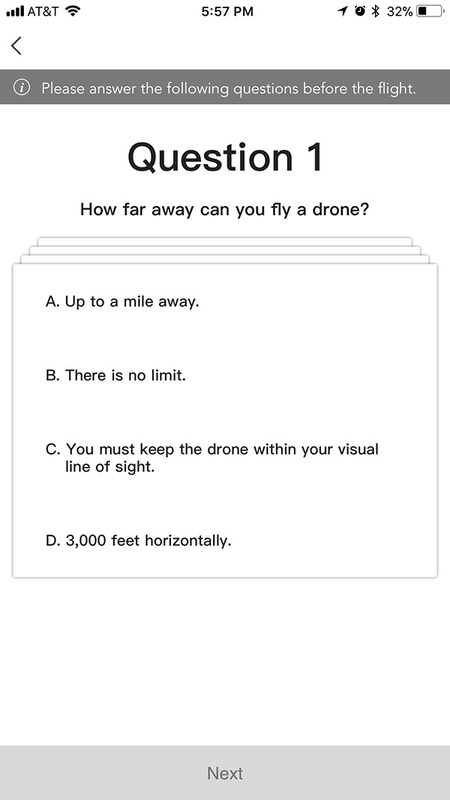 Once you complete the quiz your Mavic Air will be officially activated. On the final screen in the activation process, if you tap the "Academy" button you will find some tutorials by DJI as well as a little flight simulator. To use the flight simulator your drone has to be powered on. But don't worry, when you move your control sticks to take off and fly around, your Mavic Air will stay firmly on the ground. Only the one on screen will respond. There is about a 100% chance that you will need to update the firmware on your Mavic Air and the Controller before you take your first flight. It's easy and should take less than ten minutes. First, you need to check to see if you need to do an update. When you launch the GO 4 app, it automatically checks to be sure you are running the latest version of the firmware. Check the charge level of the battery and controller. If the battery is below 50%, put it on the charger and grab a new one. If the charger is less than 50% you are going to need to plug it in. Go get a snack and it should be ready to go again by the time you get back. Make sure your phone is connected to the internet. Connect your phone to the Controller. Power up the Controller and the Mavic Air, then launch the GO 4 app. If you see this screen, just tap "Update Now" and follow all the directions. Assuming you have reasonably fast internet, it won't take longer than five or ten minutes to complete the upgrade. When it's done shut everything down, pack it in your bag and get ready to go flying! 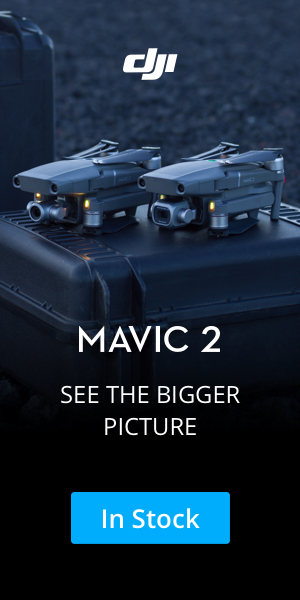 Your Mavic Air is now set up and ready to fly! The hard part is done. Now it's time to have some fun. Before you go out for your first flight you might want to check out my tutorial on Your First Flight With Your New DJI Mavic Air.